Programs that do not have direct download links are suspicious immediately, especially if those programs have official homepages. TowerTilt is exactly that kind of a program. It is an adware application and you can read more on at towertilt.com. At first it seems that the website can provide useful information on TowerTilt, but it is very generic and you cannot find out anything useful about the application. We would strongly recommend that you remove TowerTilt from your computer, because adware programs present particular computer security threats that you should not ignore or tolerate. 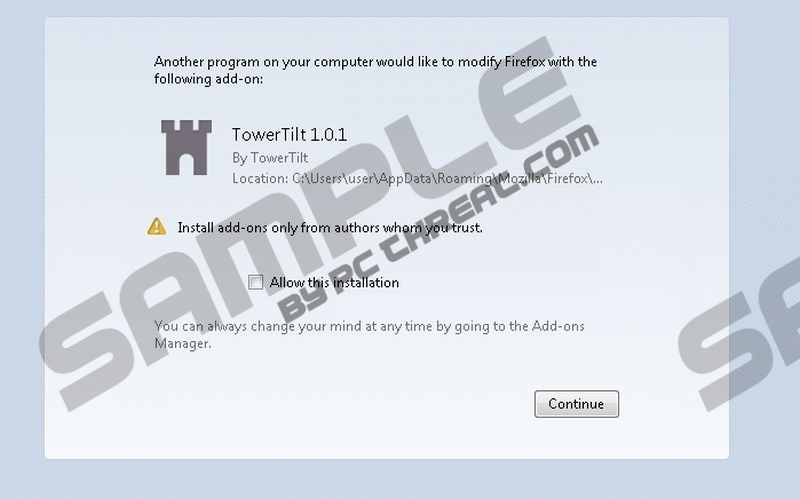 TowerTilt comes from the SuperWeb family of adware applications. It is practically identical to Cling Clang, Laflurla, Fortunitas and other similar plugins. None of them have direct download links. It means that TowerTilt and other SuperWeb applications travel bundled with freeware installers and downloaders. It also means that users install TowerTilt onto their PCs themselves. Users are usually unaware of that, because the third-party installer does not notify about additional software installation. When TowerTilt enters your PC, it adds an entry on the list of installed programs in Control Panel. It also adds extensions to Internet Explorer and Mozilla Firefox web browsers. Then it collects information on your web browsing habits. This information is necessary to generate pop-up ad content. TowerTilt displays commercial advertisements on online shopping websites, such as amazon.com, bestbuy.com or ebay.com. If you want to avoid any dire consequences, you need to delete TowerTilt from your computer. Open your Control Panel and uninstall the application. After that, open Mozilla Firefox and remove the add-on manually. We provide manual removal instructions for that below. Do not forget that TowerTilt and other similar applications usually come in packs. Therefore, you should run a full system scan to check whether you have other potentially unwanted applications on board. If so, acquire a powerful antispyware tool that would terminate all the potential threats for you automatically. Always keep your computer safeguarded against unwanted intruders, and if you have any specific computer security-related question, you are always welcome to leave a comment in the box below this description. Go to Uninstall a program and remove TowerTilt. Click Uninstall a program and remove TowerTilt. Select Add or remove programs and uninstall TowerTilt. Disable and remove TowerTilt from Extensions. Restart browser. Quick & tested solution for TowerTilt removal.